Earlier today, I was looking at two 19th century terraces of houses on Clanchy Terrace in Charleville, Co Cork, that attracted my attention as a I strolled around the town on Saturday afternoon [5 January 2019]. One terrace is a Georgian terrace of three houses, dating from the 1830s, that includes an early convent of the Sisters of Mercy and the birthplace of Eliza Alice Lynch (1833-1886), the Charleville-born woman who has become the ‘National Heroine of Paraguay.’ The Victorian terrace on the other side of the street dates from around 1880. Three other houses in Charleville also dating from around 1880 caught my eye on Saturday afternoon too: two houses on Clanchy Terrace that include the former rectory that later became a Christian Brothers’ monastery, and an unusual shop on Broad Street, which leads from the Main Street to Clanchy Terrace. Looking down Broad Street towards Clanchy Terrace, O’Flaherty’s on the right or south side of the street was also built around 1880. This terraced, three-bay, three-storey house and shopfront now looks like needing care and attention. But it still has attractive rendering and windows upstairs, and has many unusual features, including the mannered volute, a simpler interpretation of a classical motif. The Art Deco-style fascia and signage give a second, 20th century style to the building and the overall streetscape on Broad Street and creates a pleasant contrast with both the rest of the building itself and the neighbouring properties on Broad Street. At the bottom of Broad Street, the vista downhill is closed on Clanchy Terrace by an interesting five-bay house that stands on a prominent position. This attached three-storey house, also built around 1880, has five-bay ground floor and first floor and a three-bay second floor, with a single-bay single-storey extension that may have once been used as a garage or a workshop. This house has an unusual asymmetrical façade that provides interest and a contrast to the rest of the street. The windows may indicate the internal layout and rooms in the house. Its interesting features include the terracotta chimneypots and stone sills. The render ornamentation is typical of Charleville and adds textural interest to the site. Further north on Clanchy Terrace, the former Victorian rectory was also built ca 1880, and half a century later became the Christian Brothers’ monastery in Charleville in 1927. This former rectory and monastery is typical of modestly sized religious structures in Ireland at the time. It is a detached, two-storey Victorian house with a five-bay front elevation. There is a slightly-projecting gable-fronted south end bay, with a canted bay window at the south-east. Although the house is now appears abandoned and the gates are secured with chains and a padlock, this is still an attractive building on Clanchy Terrace. The bay window and gabled bays of the former monastery give a lively appearance to the façade, along with the variations of render that add textural interest and articulate the structure. The ornamental elements include decorative, carved, timber bargeboards with carved foliate designs, the eaves brackets and the piers at the entrance that show the work of local craftsmen. I was not able to get in to see the outbuildings set around a courtyard and that are said to add character to this site. But I did catch a glimpse of the round-headed, coloured-glass windows on the first floor of the extension, which probably indicate the location of the brothers’ chapel. The Christian Brothers came to Charleville in 1866 at the invitation of the Parish Priest, Father Thomas Croke. They opened a school on the Main Street, and 200 boys were registered on the first day. The primary school was located on the ground floor, the secondary school was upstairs, and the brothers lived in the attic. A new school opened in 1970 and the old school was handed back to the parish. Since then, the school building on Main Street has fallen into disrepair and has been put up for sale. Dev later finished his secondary education at Blackrock College, Co Dublin. Later on Saturday afternoon, I visited his childhood home near Bruree in Co Limerick, north of Charleville. Did Santa call to your home? Did you get good presents? Barbara and I got a box of biscuits from this school, so thank you. But, what presents do you think Jesus got for his birthday? 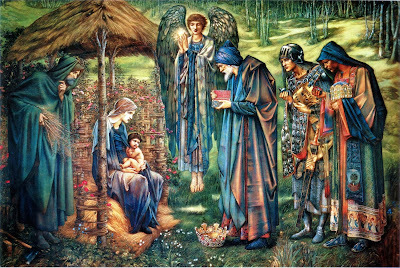 In Church yesterday (6 January 2019), we heard the story (Matthew 2: 1-12) of the Three Wise Men, the Three Kings or the Three Magi, who brought their gifts, their presents to the Christ Child in the Manger. Caspar is seen an an older man with a long white beard, who is first in line to kneel before the Christ Child and who gives him the gift of gold. Melchior is a middle-aged man, giving frankincense. Balthazar is a young man, very often black-skinned, with the gift of myrrh. So the three presents they bring to Bethlehem goldd, frankincense, and myrrh. They are not the sort of presents I ever got as a child. So, what do you think there mean? ● Gold is a symbol of that Christ is a king – The King. ● Frankincense is used to give a nice smell in the Temple and in many churches – this means Christ is at the centre of our worship – the best example of a priest, the one, true priest. ● Myrrh is used later to anoint his dead body after his death on the Cross on Good Friday. So these are presents not just for a priest, a prophet or a king, but gifts for God. It means too that we must always make a connection between Christmas and Easter. If you wanted to give a gift to Christ, what would you bring him? No matter what gifts we bring, how rich or humble we are, they are acceptable to God. But the best gift of all is the one God gives us is the gift of his Son, born as the Christ Child at Christmas. And this is the gift that gets us to love God and to love one another. 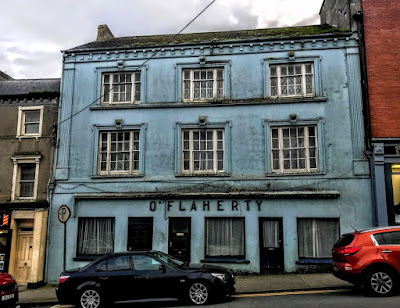 I took Saturday afternoon off [5 January 2019], and two of us visited Charleville in north Co Cork and nearby Bruree on the borders of Co Limerick and Co Cork. On Saturday afternoon, I visited Clanchy Terrace, with its interesting buildings, including the former rectory, the first convent of the Sisters of Mercy in Charleville, and two terraces of 19th century houses. There are two interesting terraces of houses on Clanchy Terrace, a Georgian terrace on the west side dating from the 1830s and a Victorian terrace on the east side dating from the 1880s. 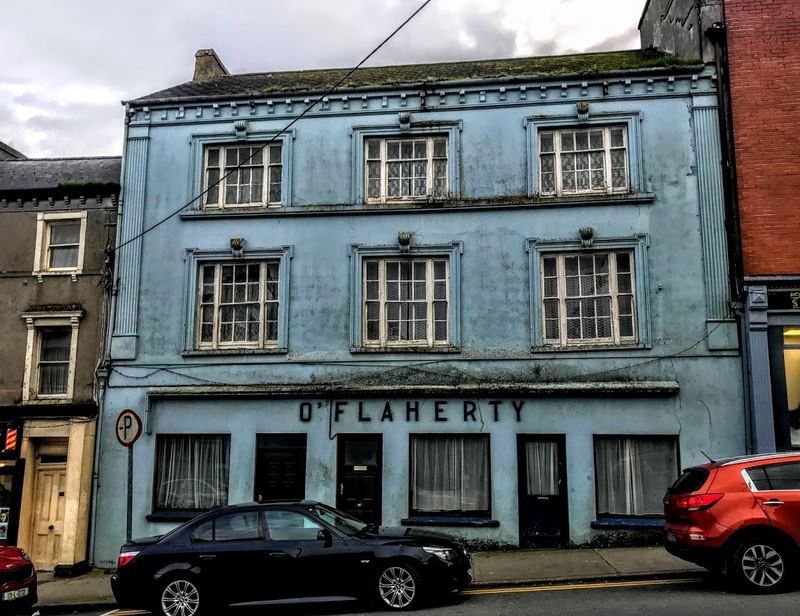 The Clanchy family were a well-known business family in the Charleville and gave their name to this terrace. The first house at the south or left end of the terrace on the west side of Clanchy Terrace is an end-of-terrace, three-bay, three-storey house, built ca 1830. It has a hipped artificial slate roof with carved limestone chimneystacks and a render eaves course. The rendered walls have painted render edging and a plinth. The square-headed openings have painted render surrounds, painted stone sills and replacement uPVC windows. The square-headed door opening has a render surround, a replacement uPVC door with sidelights and overlight, and is approached by flight of cut limestone steps. However, looking at the two other houses on the terrace, this house has lost its carved timber engaged columns that originally supported a timber pediment with a spoked fanlight and carved cornice. Like the other houses on this terrace, it is set back from the street with a painted rendered stone wall, cast-iron railings, and square-profile dressed limestone piers. This fine house is prominently sited and presents a strong façade to the streetscape. 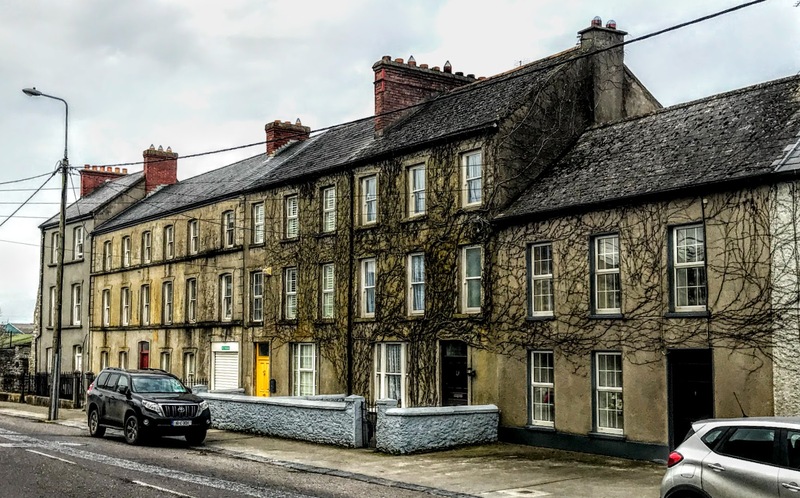 The form of the building and its elevations are classically inspired and heavily influenced by the 19h-century fashion for diminishing windows, a common feature of town houses such as this in Co Cork. Along with much of its original form, the house also retains notable features such as the cut-stone steps and the carved limestone chimneystack. The second, mid-terrace house is also a three-bay three-storey house, built ca 1830. It too has a pitched artificial slate roof with a carved limestone chimneystack and a render eaves course. 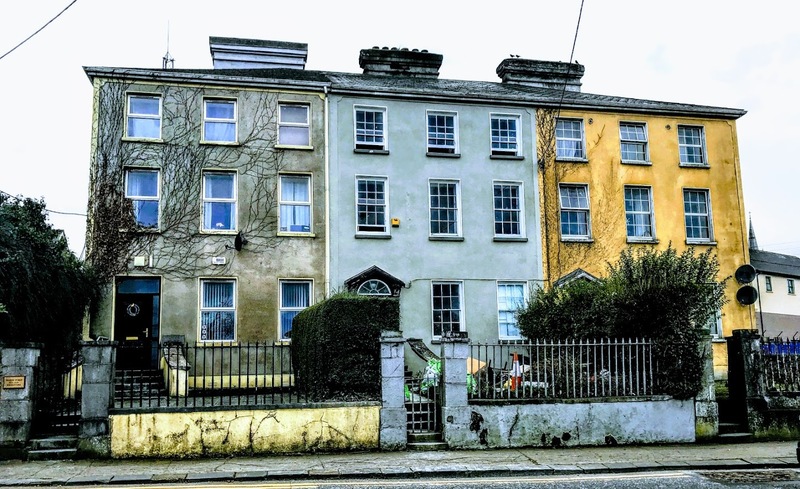 There are square-headed openings with render surrounds, painted stone sills and timber sliding sash windows, which are 6-over-3 pane windows on the second floor and 6-over-6 pane windows on the ground floor and the first floor. The house has a square-headed door opening, approached by a flight of cut limestone steps. The replacement uPVC door is flanked by carved timber engaged columns supporting a timber pediment with spoked fanlight and cornice. The form of the handsome house is embellished by the decorative doorcase, with classical features such as the pediment and engaged columns, providing a focus for the façade. The house retains its six-over-six pane timber sash windows, that are typical of terraced 19th-century houses in Ireland. The site retains cut stone steps, piers with simple caps, and cast-iron railings, which illustrate the skill of masons of the time, as does the carved limestone chimneystack. This house was given to the Sisters of Mercy by the Clanchy family. The Sisters of Mercy arrived in Charleville and set up a house here on 29 October 1836. 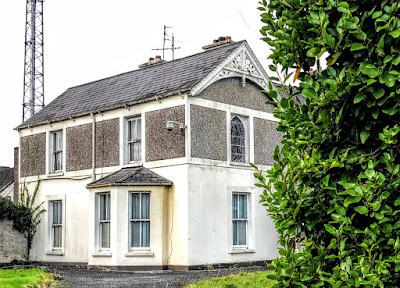 This was the order’s third house, and Catherine McAuley, Sister Mary Angela Dunne and two novices came from Baggot Street, Dublin, to Charleville on the invitation of the parish priest, Father Thomas Croke, and Mary Clanchy, whose family gave their name to Clanchy Terrace. The nuns continued to live in this house until a new convent was built a few years later. These nuns in Charleville went to the Crimean War in 1855, and also established convents in Buttevant and Midleton, Co Cork, New Inn, Co Tipperary, Kilmallock, Co Limerick, and Bathurst, New South Wales, Australia. The house at the right or north end of this terrace on Clanchy Terrace stands on a prominent corner site. 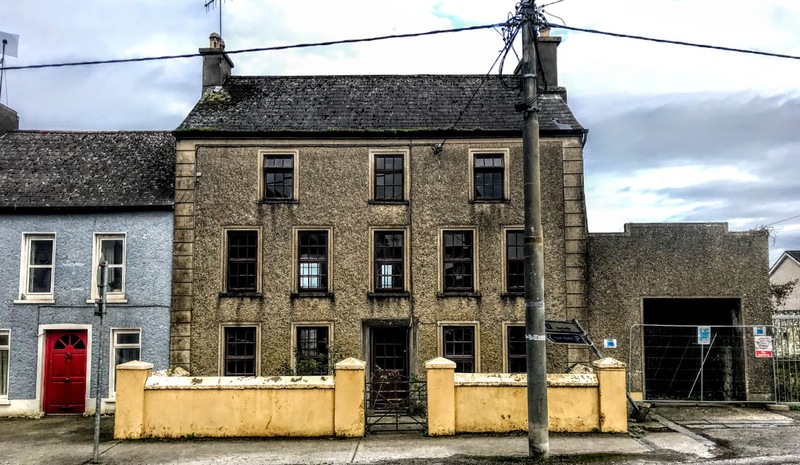 This end-of-terrace, three-bay, three-storey house was also built ca 1830, and, like the other houses on this terrace, it has a hipped artificial slate roof with carved limestone chimneystacks and a render eaves course. There are square-headed openings with render surrounds, limestone sills and replacement uPVC windows. The square-headed opening with a timber panelled door is approached by a flight of limestone steps and is flanked by carved timber engaged columns that support a timber pediment with a spoked fanlight and carved cornice. This end-of-terrace house presents a symmetrical and regular façade to the streetscape of Charleville, continuing the form of the adjoining houses. The provincial Georgian style doorcase provides a decorative focal point, the diminishing windows emphasise the vertical thrust of the building, and the house retains interesting and well executed features such as the chimneystack, surrounding wall and cast-iron railings. This is the house where Eliza Lynch was born on 19 November 1833. Her father was Dr John Lynch, and her mother, Jane Clarke Lloyd, came from a long line of naval officers. She was baptised in the former Catholic Church on Chapel Lane in Charleville on 2 May 1834, but her family later moved to Paris. A woman of renowned beauty, she had an intriguing life as a Paris courtesan and mistress to the president of Paraguay, where she moved, before eventually being forced into exile back in Paris, where she died in 1886. On the opposite side of the street, a less imposing but equally elegant terrace of houses was built half a century later, ca 1880. The terrace begins at the left or north end with a two-bay three-storey house with attic accommodation. This substantial house retains its one-over-one pane timber sash windows. The gate and railings are examples of late 19th and early 10th century metalwork and the round-headed window and its unusual slated sill to the rear add interest to the rear elevation. The second house on this terrace is a six-bay, three-storey house, with a square-headed integral carriage. This large house provides a structural contrast to the terraces of mainly two and three-bay houses on the street and retains much of its handsome and regular form. The terrace ends at the right or south end with a pair of three-bay, three-storey houses. There are other interesting houses on this street, and I hope to look at them later today. But I left Charleville on Saturday evening with an image of the contrasting lives lived by the Mercy Sisters who came to Clancy Terrace to start their convent in Charleville and Eliza Lynch who moved from Clancy Terrace to an intriguing life in Paris and Paraguay.